Meet Jessie Pasquale, resident state trooper in Frog Ledge, Connecticut, home of the Pawsitively Organic Mysteries. My town used to be quiet. I mean, you kind of expect quiet when you think small, country town in New England, right? That’s what Frog Ledge was - cows, Christmas tree lightings, concerts on the green, friendly neighbors. As the resident state trooper, my job was basically pleasant. I mean, we had our share of crime. Stolen bikes, trespassing skateboarders, vandalized tractors. All reasonable, manageable problems. Until that woman moved in, and dead bodies started turning up on my police reports way too often. Yes, that woman has a name - an odd one, if you ask me. Stan. Kristan, I’m told, and she gave herself that nickname. Not sure why she did that, but I guess that should be the least of my worries. Frankly, her job’s a little iffy too - baking dog treats? It’s quaint and all, but I’m not sure how that’s a career path. Although Char Mackey told me that she’s some whiz with investments and made herself a lot of money. I’m suspicious of people like that. Technically, she hasn’t done anything wrong. I mean, it’s not like she killed any of these people - that I know of. Still, it’s a big coincidence that she shows up and people start dropping like flies. First, the town vet, and now Hal, our dairy farmer. And if that’s not bad enough, she’s always in the middle of the mayhem. Emmalee Hoffman, Hal’s wife, told me that she’s working on the farm since Hal died. Really? She’s about as qualified to work on a farm as I am to write a screenplay. Which is not very. Here’s the worst of it - my little brother Jake is sweet on her. I can’t figure it out. He usually has such good taste. I mean, she’s pretty and all, but she’s a little too uptight for him. One of those city girls, you know the kind I mean? The ones with fancy jobs? Meanwhile, Jake is so laid back. He does NOT have a fancy job, and he’s not a city boy. He loves Frog Ledge. He came back here after being away for a while because he missed it and he wanted to run his pub here. I can’t see him up and leaving on her whim - and I’m sure after a while, she’ll decide she doesn’t like the stench of cow manure anymore and want to leave. So either she’ll break his heart or he’ll compromise what he really wants for her. Our youngest sister Brenna thinks I’m just being cranky. I’m not cranky, but maybe I’m overprotective. I really hope Jake’s not making a mistake. He’s a good guy, even if we don’t always see eye to eye. But I’m still going to keep my guard up. After all, this is my town and he is my brother. And I’d do anything for either of them. Liz Mugavero is the author of the Pawsitively Organic Mysteries. The first book in the series, Kneading to Die, is an Agatha Award nominee for Best First Novel. 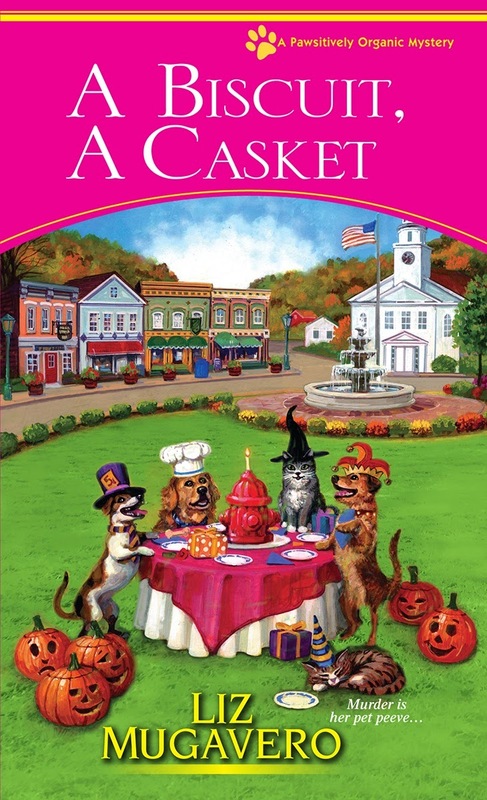 A Biscuit, A Casket, is available now. As you can imagine, her canine and feline rescues demand the best organic food and treats around. She holds a Bachelor of Arts in English from Salem State College and a Master of Arts in writing and publishing from Emerson College. She is a member of Sisters in Crime, Sisters in Crime New England, Mystery Writers of America, and the Cat Writers’ Association. Brenna and Jake could be right . . .
Jessie, you need to chill. Stan and Jake know exactly what they are doing.